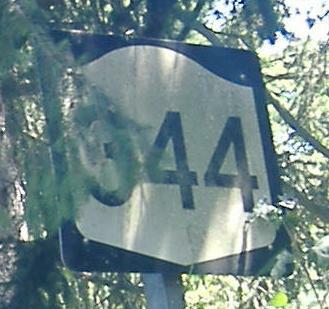 NY 344 is a three-legged route. 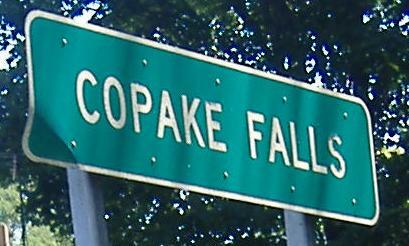 Technically it only uses two of the legs and a reference route makes up the third, but signage does not distinguish whether NY 344 meets NY 22 by using the old road to the south or the north out of Copake Falls. (In point of fact, it heads north.) This page is rather sparse, but there are better signs across the border in Massachusetts, where at least one of the roads is state-maintained but there are no route numbers. Follow the link at the bottom of this page. 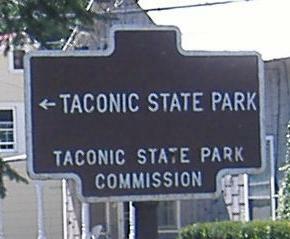 Heading south on old 22 and east on NY 344 to its original beginning, where it turns off of old 22 and heads through a bit of New York park before hitting Bashbish Falls on the MA side. That sign has been repainted - I imagine the original scheme was black on white like all the other old NY signs I've seen. Old 22 NB, also signed as NY 344 EB but not actually. I'm too lazy to look up the reference route.